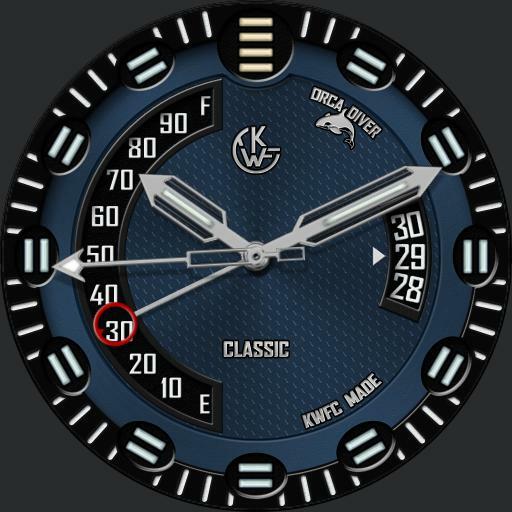 Classic version of the original ORCA face with new colors. Tap between 7 and 8 to enter Chrono mode and start/stop chrono. Tap between 4 and 5 area to exit and reset. Main hands double as Chrono hands. Tap Center for dim mode menu. Tap Color text to cycle analog dim mode color. Tap Mode text to cycle dim modes Normal, Always On, Auto Always On, Auto Always Plus and Off. Tap X to close.